Poor Guy has lost a leg! 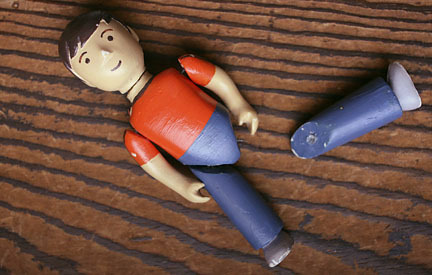 Jack’s fearless adventure companion featured in my two books, Below and Sky-High Guy, needs some repair. When I was first planning the photographs for Below, I knew that I wanted Jack’s favorite toy to be one that would only exist in that book. I didn’t really know how to make a doll, but I certainly played with enough as a kid, so I gave it a try. Guy was made out of a clay called Sculpey that can be baked in a toaster oven. 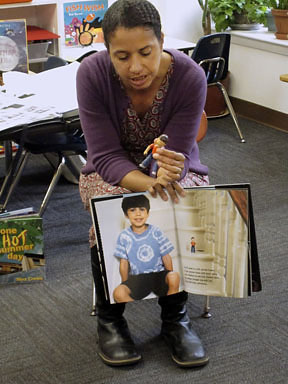 I gave him dark brown hair and olive skin like Jack, the boy who inspired the book and posed for the pictures. I modeled the arms, legs and head and attached them with wire threaded through his body. While writing Sky-High Guy, I knew that Guy would be in for rougher treatment, so I cast my original using a plastic compound and made a couple of copies. This way, if Guy got too beat up from being tossed in the air, I would have a replacement. 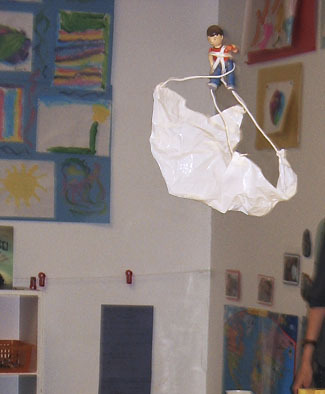 His parachute is made from a plastic grocery bag and some string. Now, one of Guy’s “clones” travels with me to school visits. He sits quietly through most of my presentation and then performs his flying routine. A week ago, this one lost his leg landing on a tiled floor. Back to the workshop he must go for repairs. Hopefully, he will be back up and on the school circuit soon!